Shares of Cloud Peak Energy, Energy Transfer Equity, and U.S. Silica have been on a tear. Is there more room to run? Thanks to rising oil prices and a sense that the industry is on the mend, shares of energy stocks have been on a tear as of late. The energy industry was one of the best-performing asset classes in 2016. Three companies that have done particularly well over the past year are coal miner Cloud Peak Energy (NYSE:CLD), oil and gas transportation and logistics provider Energy Transfer Equity (NYSE:ET), and industrial sand supplier U.S. Silica Holdings (NYSE:SLCA). Over the past year, all three of these stocks were up more than 100%. After such a spectacular run, it's worth asking whether these stocks are now overvalued or if they are at the start of something big in the future. Let's take a quick look at each business and why its stock has gained so much recently, as well as whether there is any juice left to squeeze out of shares in these respective companies. You do have to give credit where it's due: The management team at Cloud Peak Energy has done quite a bit to make the company a more worthwhile investment lately. Thanks to a modest jump in coal prices in 2016, it was able to turn a profit for the year, put some free cash flow toward paying down debt, and secure an export contract in Asia for 1.9 million tons in the first half of 2017. Those three were some of the driving factors that led to a 152% rise in its stock over the past year. Whether Cloud Peak is a buy today largely depends on your investment time horizon. If you are looking for that multidecade investment that you don't have to think about, then this isn't the stock to watch. That said, there are some reasons to think Could Peak could do modestly well over the next couple of years. Coal is undoubtedly on the decline in the U.S. Even coal producers -- who paint the rosiest picture possible in investor presentations -- estimate that an additional 50 GW of coal plants will retire between now and 2021, with no new coal plants coming on line. Even with these reductions in demand, though, coal use at power plants will still represents a decent chunk of power production in the U.S. Offsetting those domestic declines is growing demand from places such as India and Southeast Asia. If Cloud Peak and other U.S. producers can capitalize on exporting to these new demand centers, then it has the potential to maintain decent production and generate a return for investors. That return will likely be muted, though, as the company recently announced it was issuing 13.5 million shares to pay down some debts. That's a 22% increase in total share count and will significantly reduce per-share returns for investors. Cloud Peak is slowly clawing its way back from a tough few years, and it could have a couple of good years ahead of it. For investors, however, there are other investments with higher rates of return out there with better prospects for a long-term future. It's not that often that a $20 billion energy company doubles its market cap in less than a year, especially one in the humdrum oil transportation business. Yet here we have shares of Energy Transfer Equity up 121% over the past year. 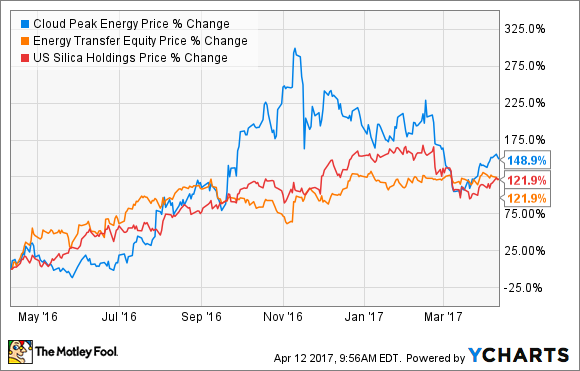 There are two primary reasons Energy Transfer Equity's stock was able to post such a significant gain. The first is that the company's stock was suffering mightily up until about a year ago from its proposed merger with Williams Companies. Investors were souring on the proposed deal as it was looking to be a massive overpay for the natural gas transportation and logistics provider. Also, the large debt loads at both entities made creditors nervous. So much so that Williams' credit rating was downgraded to junk status and Energy Transfer was at risk of a similar fate. Fortunately, Energy Transfer was able to walk away from the deal mostly unscathed. The second reason for this investor optimism is that it has orchestrated several restructuring moves at its subsidiary master limited partnerships to ensure its longer-term health. Last November, subsidiary Sunoco Logistics Partners (NYSE:SXL) announced it would buy its sister company Energy Transfer Partners (NYSE:ETP) in an all-stock deal. The restructuring not only simplifies the complex web of subsidiaries Energy Transfer Equity owns, but it will also help improve its credit rating as Energy Transfer Partners can unload its onerous debt load onto Sunoco Logistics' balance sheet. The largest beneficiary of these deals is Energy Transfer Equity. Energy Transfer Partners' shareholders will see a payout cut when converted to Sunoco Logistics shares, and Sunoco Logistics will have to saddle the burden of Energy Transfer Partners. Energy Transfer Equity, on the other hand, will ensure that payments to it are more secure over the longer term. Energy Transfer Equity looks like it is on more stable ground today thanks to this move, but investors looking at owning stocks for extended periods of time have to question all of the corporate reshufflings in which Energy Transfer Equity and its subsidiaries engage. Until we can see that these most recent moves are paying off for the entire Energy Transfer universe, this may be a stay-away stock. Of the three companies in this group, U.S. Silica Holdings seems to have the most going for it right now. Just about every company that provides frack sand to the oil and gas industry was hit hard when prices started to crash, but U.S. Silica fared better than most others because it was in a better financial position. In fact, the company was able to use its financial strength during the downturn to make two acquisitions: a sand mine in Texas that will better serve the Permian Basin and a frack sand logistics specialist that reduces loading and unloading times. These two deals should better position U.S. Silica to provide for the increasingly important West Texas market and provide last-mile logistics that few of its peers can replicate. What is also encouraging about the sand business today is that there have been some changes to drilling techniques that favor sand producers. The amount of sand used per fracked well in every shale basin across the country has more than doubled and, in some cases, more than tripled. Image source: Emerge Energy Services investor presentation. With so much additional sand injected into a single well, it will take much less overall drilling activity for total sand proppant demand to get back to pre-crash levels or even more. U.S. Silica has already said it has been spending a little extra to get its formerly idle mines back up and running, so the coming quarters we could see a strong rebound. Supplying sand to the oil and gas business will be a cyclical one, but U.S. Silica has shown to be a better operator than most of its peers and should be able to handle the ups and downs well. Today's stock price still represents a hefty discount to pre-cash days, the industry has a strong tailwind, and U.S. Silica is probably an investor's best bet for the future of this industry. That makes U.S. Silica's stock the most interesting of the bunch today.